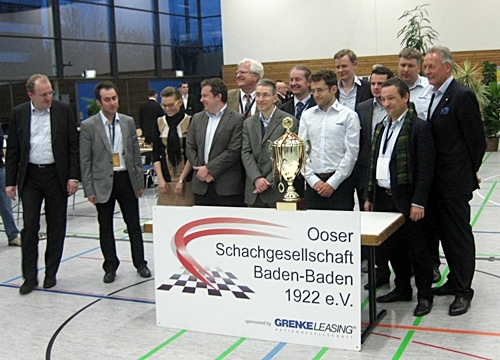 Baden-Baden have won the German Bundesliga for the 9th year in succession. For the final three matches this weekend the German juggernaut was able to call on world no. 2 Levon Aronian, who got back to winning ways and told chess24 afterwards it was necessary “just to get a confirmation you’re a good player”. 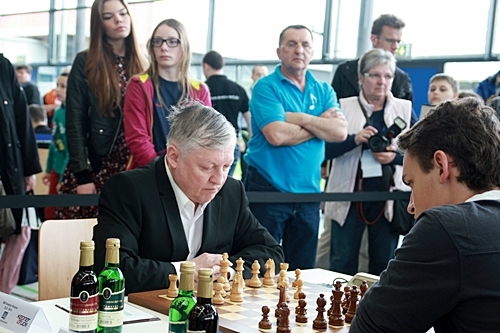 62-year-old former World Champion Anatoly Karpov also confirmed class is permanent by beating 2664-rated Maxim Rodshtein with the black pieces. The proximity to the Russian League starting on Monday may have curtailed the list of star players, but champions elect Baden-Baden have a habit of bringing out the big guns… just to show they can! Vishy Anand made his first appearance of the season for them in the run-up to the Candidates Tournament (if you missed it here's Jan Gustafsson’s account of that weekend), and now world no. 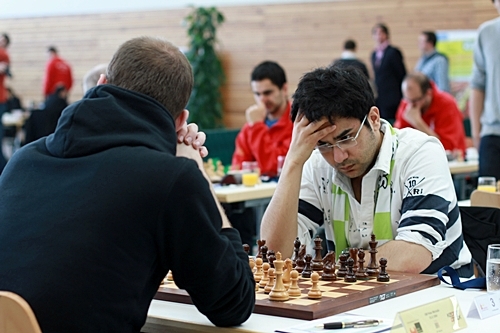 2 Levon Aronian made his first appearance for the final weekend. Perhaps Rapport had glanced over Nigel Short’s shoulder at the recent Gibraltar Masters, though Aronian’s reply 4…h6 was already a novelty. Short’s opponent Docx had hit back in the centre with 4…d5 but went on to lose. Aronian instead drew a short but engaging encounter. 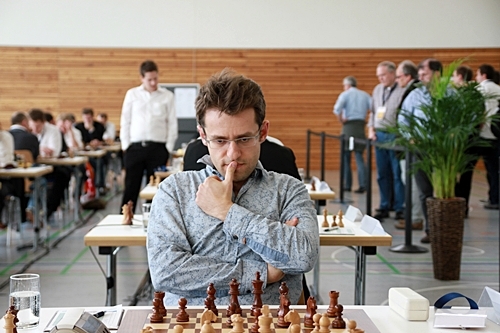 Levon Aronian: I don’t have to play at all. It’s always my choice and it’s nice that the team allows me to play whenever I want to. I've asked maybe two months in advance and it’s good to play three games instead of two – it’s more fun! Macauley Peterson: After the long and gruelling tournament in the Candidates, would you just as soon have a break, or is it nice to be playing again? When you’ve played badly it’s nice to play again, just to get confirmation that you’re a good player. Well, surely you don’t need confirmation of that! I think everybody does. Every time you lose a couple of games you need to win again, just to feel normal. Rather than just going to a beach and forgetting about chess for a while...? I will do that, but I thought it might be a good idea to play here, since I didn’t really have any other time to play in the Bundesliga. That’s why I looked forward to this. Today of course you were playing someone you’ve worked with. How does that change the character of the game...? I've tried to play something we haven’t analysed together, something out of theory. 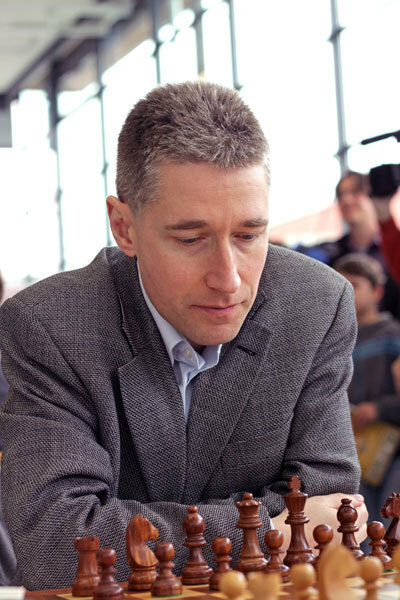 I have many openings to play – central openings – as we haven’t analysed the whole game of chess together. We’ve analysed some bits of it. So, it makes your brain work. Yes, I’m happy that I won the game. It was a complicated position, an interesting line. Somehow after 31.Rf8 at first I thought it was a dead draw, but then I knew that he has to play accurately. When he didn’t play h5 at that moment I felt I had good chances to win. Other than that I think the game was pretty balanced. It would have been a draw had he had more time. What are you going to do after this weekend? After this weekend, I’ll relax – I’ve had too much chess lately – and think how to improve my chess. I will play in Stavanger. You’re going to spend quite some time in Norway this summer. I like Norway, so I look forward to that! 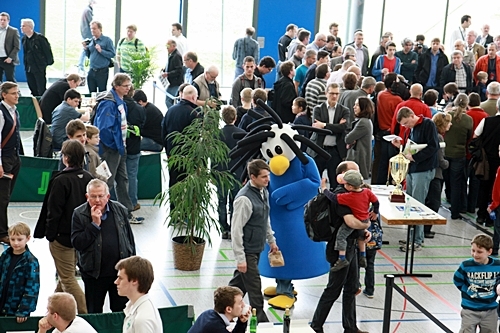 The title drama on the Bundesliga weekend was packed into Friday’s match between Baden-Baden and the team that eventually finished third, Hockenheim. After a surprisingly tense struggle draws were agreed on 7 of the 8 boards, leaving only Michael “Spiderman” Adams weaving his webs against Rainer Buhmann. It's the kind of position where obviously you don't risk anything and you have to try and find a way to win, but it's still quite complicated… I was finding queen and pawn endings, lots of queen and pawn against queen positions, probably not correctly, but they kept on coming up. 3 against 3 on the kingside and 3 against 3 on the queenside. Two good kings, bishops of the same colour and apparently no points of attack. A draw, right? Nothing could be further from the truth, as Adams now gives a masterclass on how to pose your opponent problems. 34. g4 A natural move, trying to open a path for the king, or at least create a weakness. 34... hxg4+ would be the normal technique here, trying to maintain a symmetrical structure without any inbalances, but White's idea would be to try and imbalance the kingside in any case by starting with 35. ♔xg4 followed by f4 and f5, when it's not so easy to defend. Let's take a look: 35... ♔d6 36. f4 ♗c3 37. f5 g5 (37... gxf5+? isn't a viable option as it leaves White with a passed h-pawn.) 38. ♗f2⁉ Preventing the black king from becoming active via e5. 38... ♔e7 39. ♔h5 ♔f7 40. c5 and although Black should be able to hold this position it wouldn't be so easy due to the emergence of new weaknesses. 35. gxf5 gxf5 36. ♗f4 ♗f6 Black already has two potential weaknesses on the kingside as his pawns are weak and his king is far away. Adams now fixes a weakness on the queenside. 37... b5 , trying to simplify, is met by 38. cxb5+ axb5 39. axb5+ ♔xb5 40. ♗xc7 ♔xb4 41. ♔f4 and, as you may have spotted before, the h-pawn queens on a square the same colour as our bishop, so White wins. 38. b5+ axb5 39. axb5+ ♔d7 In only 5 moves Adams has transformed the position from "dead draw" to "Black is going to suffer" without Buhmann having committed any obvious mistake. That's what we mean when we talk about good technique! 40. ♗e5 Giving the move back to the king. 40... ♗g5 Cutting off the path. 41... c6⁈ The position still remains drawn, but we'll soon see that Black's idea here is already a bad one. He wants to simplify, but in this case that only means "moving" the weakness from c7 to b6. 42. 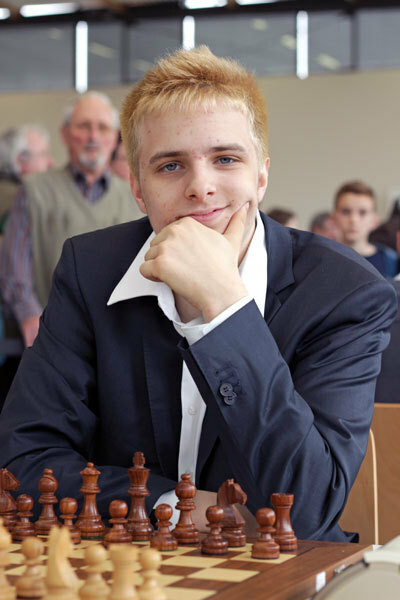 ♗d4 cxb5⁈ The culmination of black's plan - although he's not yet lost this seriously complicates his life! 42... c5 seems to draw without any apparent problems. The key is that although the white king reaches f4 White is unable to make any subsequent progress because the bishop can't attack any weak points. For example: 43. ♗e3 ♗e7 44. ♔f4 ♔e6 and a draw has to be agreed. 43... ♔c7 44. ♔f3 With Be3 and Kf4 to follow... The black king finds itself too far away to defend f5. 44. ♔f4 ♔e6 45. f3 h4? But now this really is the decisive error, although Adams later gives Buhmann another chance to draw. 45... ♔d5! would have begun an exciting race that should end in a draw with very precise play. 46. ♗e3 ♔c4 47. ♔xf5 ♔xb5 48. ♔g6 ♔c6 We'll later see that this is key to the defence, attacking the white bishop that will appear on d6. 49. f4 b5 50. f5 (50. ♔xh5 b4 51. ♔g6 b3 52. ♗c1 ♔d5! The black king makes a run for the h-pawn. 53. f5 ♔e5 54. ♗b2+ ♔f4 55. f6 ♗xf6 56. ♗xf6 ♔g3 57. h4 b2 and a draw.) 50... b4 51. f6 b3 52. ♗c1 h4 53. ♗a3 ♗c7 '!' 54. f7 ♗d6 55. ♗xd6 b2 56. f8Q b1Q+ 57. ♔g5 ♕g1+ 58. ♔xh4 ♕d4+ 59. ♗f4 (59. ♕f4 ♕xd6= ) 59... ♕f2+ and curiously White is unable to avoid the checks without giving up h3, so it's a draw! A very close call! 46. ♗f2 ♗c7+ 47. ♔g5 ♗d8+ 48. ♔g6 ♔e5 49. ♗e3 ♔e6 We've reached a mutual zugzwang position, so Adams tries to lose a tempo. 50. ♗d4 restricts the black king. 50... ♔d5 doesn't control f6, and now after 51. ♗f6 ♗xf6 52. ♔xf6 Black has to play 52... f4 which after 53. ♔g5 ♔c5 54. ♔xh4 ♔xb5 55. ♔g5 ♔c4 56. ♔xf4 leaves White still "in the square". 56... b5 (56... ♔d3 is an attempt to cut off the white king, but leaves Black's own king on the wrong diagonal. 57. h4 b5 58. h5 b4 59. h6 b3 60. h7 b2 61. h8Q b1Q 62. ♕h7+ Farewell queen!) 57. ♔e3 ♔c3 And once again the black king has to put itself on a bad square. 58. h4 b4 59. h5 b3 60. h6 b2 61. h7 b1Q 62. h8Q+ and there's no way to avoid the exchange of queens, when the f-pawn will decide the game. 62... ♔c4 63. ♕d4+ ♔b5 64. ♕d3+ Winning. 50. ♗g5⁇ would be a serious and even game-losing error! 50... ♗xg5 51. ♔xg5 ♔e5 And now it's White who's in zugzwang. Therefore what you need to look for is a way to get this position with Black to move! b) 52... ♔e5 53. ♗g5 ♗xg5 (53... ♗c7 54. ♗xh4 ♔f4 55. ♗g5+ ♔xf3 56. ♔xf5 wins) 54. ♔xg5 reaches the position we noted after 50. Bg5? ?, but with Black to move - he loses his f-pawn. 56... ♔d5! draws by force - 57. ♗xh4 ♗c7 58. ♔g6 ♗xf4 59. ♔xf5 ♗d6! The only square from which to stop the h-pawn is f8. 60. ♗f2 (60. ♗f6 ♗g3 ) 60... ♔c4 61. h4 ♔xb5 62. h5 ♗f8 63. ♗e3 Trying to remove all the squares on the f8-h6 diagonal from the bishop. 63... ♔c6 64. ♔e6 b5 65. ♔f7 ♗a3! An only move! (65... ♗d6 loses in a very instructive manner. 66. h6 ♗e5 67. ♔e6 ♗a1 68. h7 b4 69. ♗f4 b3 70. ♗e5 ♗xe5 71. ♔xe5 b2 72. h8Q b1Q 73. ♕c8+ and White wins the black queen.) 66. h6 (66. ♗d4 ♗c1 ) 66... ♗b2 67. h7 b4 68. ♗g5 b3 69. ♗f6 ♗xf6 70. ♔xf6 b2 71. h8Q b1Q and as the d5-square is accessible for the king there's no way to win the black queen. a) 60. ♔h5 , shouldering the pawn, wouldn't succeed. 60... ♗c1 61. h4 (61. ♔g6 f4 with Be3 to follow.) 61... ♗d2 and White can make no progress because Kg6 would be met by f4. b) 60. ♔g3! The only way to win - keeping an eye on the f-pawn and improving the position little by little. 60... ♗c1 61. h4 ♗h6 62. h5 Black can only wait, controlling the b-pawn with the king and the h-pawn with the bishop. 62... ♔e6 63. ♔f3 ♔d5 64. ♗e3 ♗g7 65. ♗g5 Sacrificing the b-pawn so as to win with the h-pawn. 65... ♔c5 (65... ♗e5 66. h6 ♔c5 67. h7 ♔xb5 68. ♗f4 ♗h8 69. ♗g3 ♔c5 70. ♔f4 ♔d6 71. ♔xf5+ ♔d5 72. ♗h4 Bf6 will follow.) 66. ♔f4 ♔xb5 67. ♔xf5 ♔c5 68. ♔g6 ♗f8 69. ♔f7 and the bishop is out of squares on the diagonal, so the h-pawn is unstoppable. 58. ♔g5 ♔e4 59. h4 ♗xf4+ 60. ♔g6 As the f-pawn is attacked it's impossible to play Be3 - the win is now very easy. 60... ♗e5 61. h5 f4 62. ♗xb6 f3 63. h6 ♔d5 An enthralling ending that will repay studying carefully both for the ideas demonstrated and the mistakes made. That was the last nervous moment for Baden-Baden, who went on to win their remaining two matches comfortably to complete the clean sweep. Elsewhere there was no shortage of entertaining chess. Richard Rapport was involved in a real curiosity of a game. 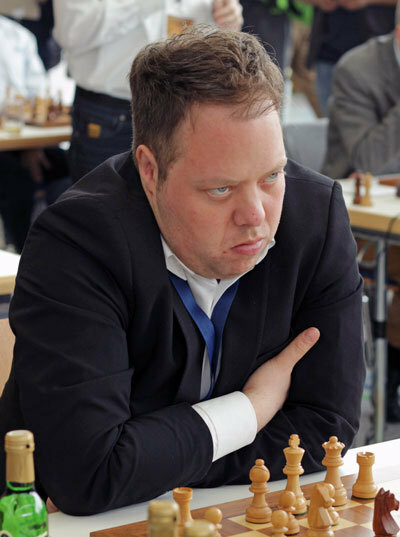 German IM Andreas Schenk (2489) has hung on for 41 moves not only holding off his fearsome opponent but also avoiding the exchange of a single piece or pawn! Alas, his 42.Nxg3, the first capture of the game, was already the losing mistake! He had to take with the bishop. Andreas resigned 12 moves later. 33…Qxf2+! When in doubt, sacrifice your queen! After 34.Kxf2 c1=Q+ 35.Kf1 Qc2 Black had covered g6 and still had a winning attack. Levon Aronian had competition as the weekend’s greatest crowd pleaser from 62-year-old Anatoly Karpov, the 12th World Chess Champion. Unlike his great rival Garry Kasparov, Karpov continues to make appearances at the board, and delighted his fans by outplaying Maxim Rodshtein with the black pieces (as you’ll have spotted, it wasn’t Rodshtein’s weekend!). Maxim jettisoned a pawn early on, which was a recipe for disaster against a player of Karpov’s technique – it’s not for nothing Magnus Carlsen is often compared to him! That was bad news for the bottom four teams, who were all relegated. Baden-Baden, meanwhile, will have a chance to make it a perfect 10 next year! Can anyone stop them?